Penguins In Paradise Video Slot Guide & Review - Casino Answers! Penguins In Paradise is a 5-reel, 25-line video slot developed by Cryptologic, featuring a wild substitute symbol, scatter wins, multipliers, a free spins feature and a bonus game. You can play the Penguins In Paradise video slot at [Americans: Unfortunately due to legal restrictions you are unable to play at any of the online casinos this game is at. We recommend you trying playing the unique slots at Win A Day Casino instead.]. Bets on the Penguins In Paradise slot machine are $0.01, $0.02, $0.03, $0.04, $0.05, $0.10, $0.15, $0.20, $0.25, $0.50, $0.75 and every increment of $1 up to $20 per line. You can play from 1-25 paylines on the Penguins In Paradise slot game. Penguins In Paradise has a large betting range – you can bet anywhere from a penny per spin up to $500 per spin. Any casual player or high roller will be happy with the betting options available on Penguins In Paradise. You can set your game speed at Normal, Fast or Very Fast. 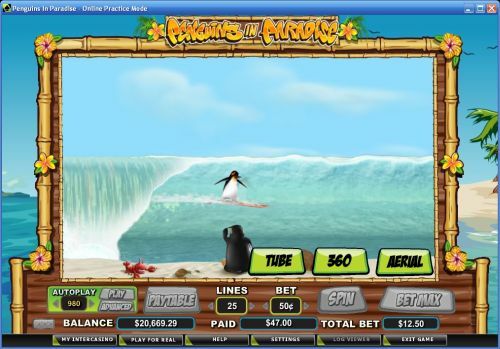 To play the Penguins In Paradise video slot, you can either hit “Bet Max” to play all 25 lines or you can press the “Spin” button once you have selected your bet. The highest paying symbol on the Penguins In Paradise video slot is the Mrs. Penguin symbol. 5 Mrs. Penguin symbols will pay out the 5000 coin top jackpot. The second highest paying symbol is the Little Penguin symbol, which will pay out up to 1000 coins. The scatter symbol on Penguins In Paradise is the Drink symbol. 2, 3, 4 or 5 Scattered Drink symbols will pay out 1X, 5X, 20X or 100X your total bet. If 3 Scattered Drink symbols land on the reels of the Penguins In Paradise slot game, you will win 10 free spins with a 3X multiplier, so all of your winnings will be tripled. The free spins feature can be re-triggered. Free spins are played at the lines and bet of the triggering spin. Free spin wins are added to payline and scatter wins. You can win lots of cash prizes by playing the free spins feature on the Penguins In Paradise video slot at [Americans: Unfortunately due to legal restrictions you are unable to play at any of the online casinos this game is at. We recommend you trying playing the unique slots at Win A Day Casino instead.]! Penguins In Paradise’s wild symbol is the Mr. Penguin symbol. It only appears on reels 2, 3 and 4 and substitutes for all symbols except for the Scattered Drink symbol. The prize is doubled when the Mr. Penguin symbol substitutes in a winning combination. When the Mr. Penguin symbol appears on reels 2, 3 and 4 at the same time, you will trigger the Penguin Surfing bonus game. You will get to select 2 of the 3 surfing tricks for the penguin to perform. The penguin’s performance will be judged and scored. The scores will then be multiplied by the triggering bet to determine your prize. If the penguin wipes out while performing a trick, you will receive a consolation prize of 2X the triggering bet and the bonus game will end. The Penguin Surfing feature can be triggering during the free spins feature. Payouts are displayed on the Paytable. Payline wins are multiplied by the bet per line. Highest win amount is paid on each selected payline. Scatter wins are multiplied by the total bet and added to payline wins. Feature wins are added to scatter and payline wins. Winning combinations pay from left to right only, except for the Scattered Drink symbol. The Mr. Penguin wild symbol appears on reels 2, 3 and 4 only and substitutes for all symbols except for the Scattered Drink. The prize is doubled when the Mr. Penguin symbol substitutes in a winning combination. You can use the Penguins In Paradise autoplay mode by selecting up to 999 autoplay spins and hitting the “Play” button. You can also hit the “Advanced” button to access its advanced features. You will be able to select stop settings including cumulative win or loss of up to $5,000, single win of up to $5,000 or upon completion of free games. You can stop the autoplay mode on the Penguins In Paradise video slot at any time. Penguins In Paradise has a creative theme in addition to its bonus game, free spins feature and a couple of good payouts. 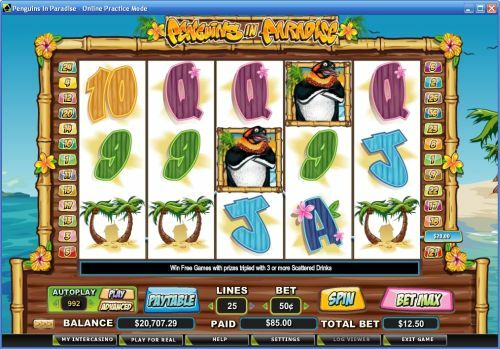 If you like a good penguin slot, you will enjoy the Penguins In Paradise video slot at [Americans: Unfortunately due to legal restrictions you are unable to play at any of the online casinos this game is at. We recommend you trying playing the unique slots at Win A Day Casino instead.]! Can players from the United States play Penguins In Paradise? Players from the USA cannot play the Penguins In Paradise online slot for real money at this time. For a penguin-themed slot American players can play, you can read our Penguin Power Video Slot Review or play it at [Americans: Unfortunately due to legal restrictions you are unable to play at any of the online casinos this game is at. We recommend you trying playing the unique slots at Win A Day Casino instead.]. Can I play an Instant Play version of Penguins In Paradise for free? You can play an Instant Play version of the Penguins In Paradise video slot at Cryptologic online casinos such as [Americans: Unfortunately due to legal restrictions you are unable to play at any of the online casinos this game is at. We recommend you trying playing the unique slots at Win A Day Casino instead.] for real money only. If you experience any issues with the Instant Play software, make sure you have the latest version of Adobe Flash Player installed on your computer.